Bono, Adam and The Edge went along to accept the award from friend and writer Salman Rushdie at the Royal Opera House in Covent Garden. The room was filled with famous faces including Stephen Fry, Tinie Tempah, Keith Richards, Bradley Cooper, and even Miss Kylie Minogue (who asked Bono to help her with her microphone). In accepting their award Bono joked, “Growing up is not what is meant to happen to a rock band. It has happened, we are now men”, while Adam called the stylish GQ Men of the Year Awards "my world". 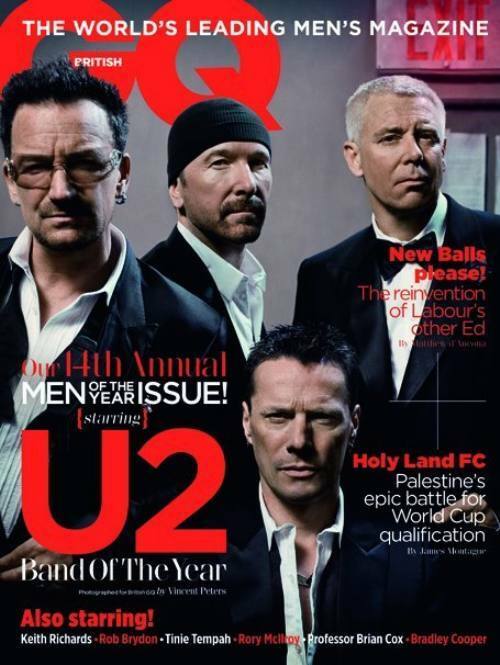 The band are on the cover of the October issue of British GQ, out now.